I just received my copy of Foundation Blender Compositing. Before having the book, I thought it will be about Node Compositing and the VSE (Video Sequence Editor). Well, I was only partially right. The book is more than that. The first portion of the book covers mainly a broad perspective of how Blender can be integrated into real world production pipelines and applications. As someone who is not natively-trained in the area of movie-making and animation, this book offers a fresh and informative perspective into that particular industry and field. Nodes compositing and video editing come later in the second half of the book’s content. The Nodes section provides examples of Node compositions that are very useful. Much tips and techniques for creating special efforts are covered within the book. Unlike many Blender Books, this one is fully in colour. However, the paper quality is not of high resolution gloss. I guess, this help in reducing the cost of production. I can certainly live with that. Notwithstanding the paper quality, the coloured screenshots are very helpful and indispensable for the delivery of information. In all, I find Foundation Blender Compositing very useful. 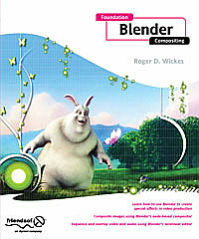 This 400+ page book is loaded with much information on the Compositing aspect of Blender. It fills an unique niche in the market with regards to Blender Books.